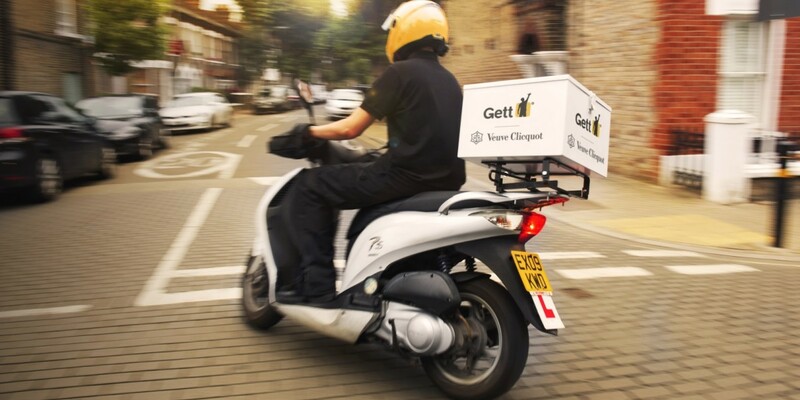 Gett, the company that used to want to take you from A to B with its ride-hailing service, now wants to bring you champagne on demand too, provided you live in certain parts of London. Announced today and facilitated by a partnership with Veuve Clicquot, from tomorrow you’ll be able to get a bottle of chilled champagne and two fluted glasses delivered within 10 minutes or less for £50. This can all be arranged within the existing Gett app. It’s only available between 4pm and 10pm to people located around Shoreditch, Clerkenwell, the City, Knightsbridge, Chelsea, Belgravia and Kensington though. If you want one anywhere else in London, you’ll just have to do it the old-fashioned way and go into a shop, or order in advance from Amazon and save yourself £10. Or Ocado, and save yourself around £20. Champagne will be delivered via scooter by riders who are studying to pass ‘the Knowledge’ test required to become a black-cab driver in London. While it’s definitely interesting to see Gett branch out and attempt to take on Uber and other companies by leveraging its established network of riders, drivers and users, it’ll be interesting to see which products or services it chooses to offer next. Champagne on-demand might be OK for some people, but the company will establish itself as firmly out of reach of the average person if high-end products are the only ones available, which probably isn’t the smartest idea for a company that relies on scale.